If you are regular investors of Mutual fund than you must be aware of this fact but for the new investors, it is necessary to understand the difference between Direct Plans and regular plans of mutual fund. Since after introduction of mutual funds scheme, there are not so much schemes, but now we have daily new schemes are introduced on mutual funds. Since it gives best returns in mutual fund, in last 1 one year, many new investors has started investing in mutual fund schemes via SIP. But most of them are not aware of the fact that Direct plans are regular plans are different thing. So, here we are explaining the difference between two plans. No, direct plans and regular plans are not different category, in fact you can find same mutual fund scheme with same name but different tag of direct plan and regular plans. The first direct plan was introduced in 2013 only and after that many rating agencies were not even rating direct plans of mutual funds but now, valueresearchonline.com and morning star, started rating direct plan separately. Regular plans: - In regular plans, mutual fund house or Assets under Management (AMC) will charge you with trail fees, distributor expense or transaction charges. Direct Plans: - In Direct Plans, you will be dealing with directly to Assets under Management, so you will be not charged with those other charges. Direct means direct, no intermediate, no middle man, direct deal with MF houses. Why we should always invest in Direct Plans? If you have observed with few mutual fund plans where they mentions you with expense ratio. Expense ratio is MONEY THAT YOU PAY TO mutual fund house to MANAGE YOUR FUND. Since in direct plans, you are dealing with mutual fund house directly, the maintaining cost will be less while in regular plan, you will be charged more with other charges plus expense ratio. Apart from that, there is difference in return given by direct plan and Regular plan. Lets check out some practical examples, where you will see the difference between regular and direct plans. 1. Birla Sun Life Frontline Equity Fund :- This plan is lunched in 2002 and its current NAV is Rs.155.23. Below is difference between Regular plan and direct plan of Birla Sun Life Frontline Equity Fund. As you can see, at last 3 year Birla Sun Life Frontline Equity Fund gives 18.38% of return in regular plan where 19.43% in direct plan. It is same plan, same fund manager, everything is same, just difference of direct and regular gives 1.05% extra return. 2. UTI Mid Cap Fund:- UTI Mid cap fund was launched in 2013 and current NAV is Rs.77.77. At 3 years of return, UTI Mid cap fund regular plan gives 34.41% of return while direct plan of UTI Mid cap gives 35.36% of return. Which means direct plan gives 0.95% of extra return. As you can see from above two examples, direct mutual fund plans give 1% return on each scheme (or we can say atlest gives more return than regular plan). When you are buying same thing, for same price, why settle for less return? Why can’t we go for extra investment return just by opting out direct plans than regular plans. You may find someone who will give excuse like what is in 1% extra. Well, 1% extra can gives you lakhs of amount. Yes. 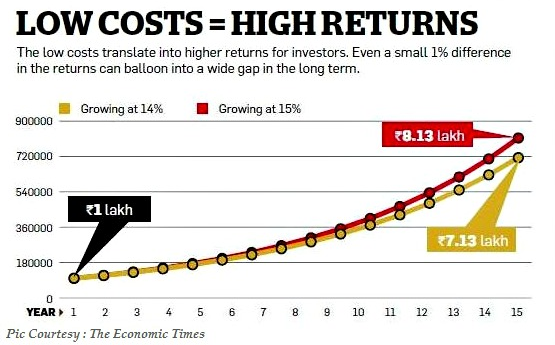 If you invest in regular mutual fund which gives you 14% return and direct plan which gives you 15% (1% extra return ) than in 15 years you gain 1 lakh rupees extra for 1 lakh of investment. Do check out below mentioned Economic times graph. Which explains direct plans vs regular plan difference. Hope this guide will help you to invest better and to earn better. Always invest in Direct plans of mutual fund.